It’s time for the celebrities to set off on the 3rd Leg of the Race. And this time, they will be getting a chance to go international with their celebrity as they fly to Los Angeles, California, USA. Teams will need to secure their own plane tickets. But really, they will be one of two flights: The first on Qantas/United arrives at 6:30am. The second on Delta arrives at 8am. 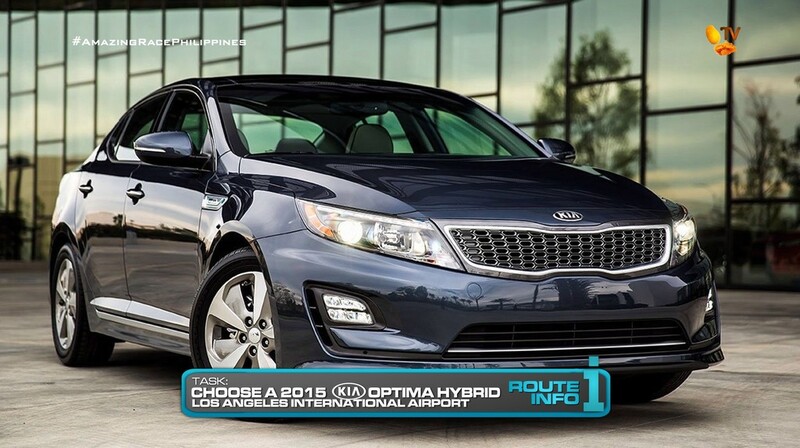 Once at Los Angeles International Airport, teams must search the carpark for flagged brand new 2015 Kia Optima Hybrids which also contain their next clue. 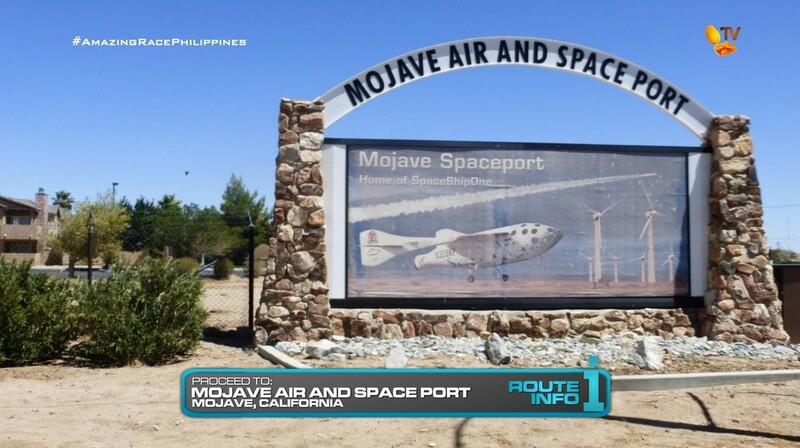 Teams must drive their cars to the Mojave Air and Space Port. The teams on the first flight find HOURS OF OPERATION! and they must wait until it opens at 9:30am. At 9:30, teams will be given their next clue and a picture showing part of an aircraft livery. 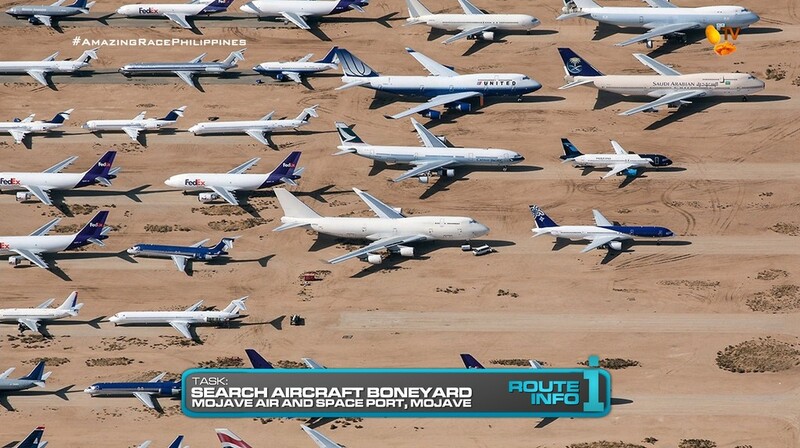 Teams must head out to the aircraft boneyard where retired planes are stored until they are disassembled for recycling parts or scrapped. Teams must find the plane whose livery matches the section shown in the provided picture. That plane will contain their next clue. 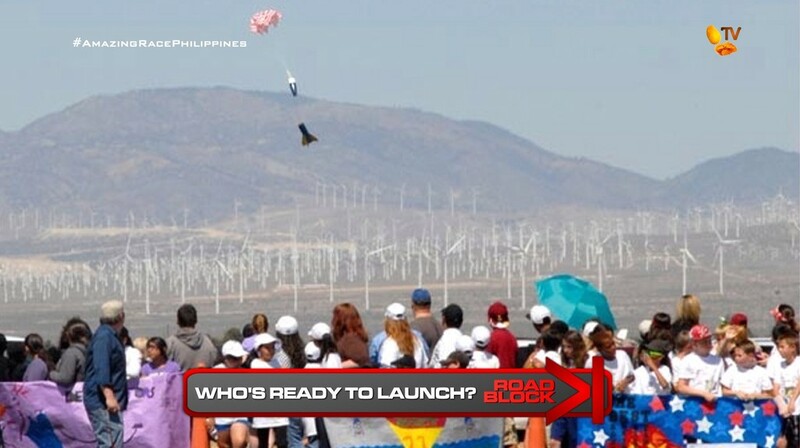 And that clue reveals the Road Block: Who’s ready to launch? Students from the Los Angeles area participate in an annual challenge to build the best model rockets. In this Road Block, teams must build their own model rocket using provided instructions and with some help from elementary school students. They must then correctly launch it high into the air to receive their next clue. After the Road Block, teams must drive themselves to the Los Angeles Reservoir in Sylmar. California is experiencing an historic drought. 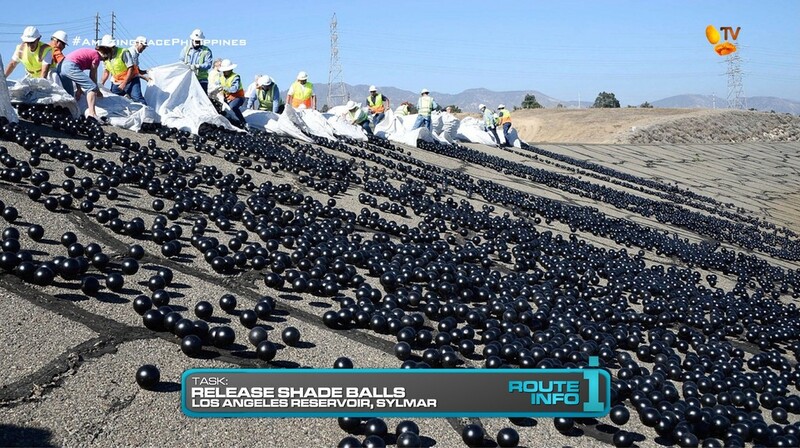 Los Angeles has released these shade balls to protect the water against dust, rain, birds, wildlife and chemical reactions caused by the sun as well as prevent the water from evaporating. Teams will help the effort by unloading ten sacks of shade balls from a nearby truck and releasing the shade balls into the reservoir to receive their next clue. And that clue reveals the Detour: Behind the Camera or In Front of the Camera. 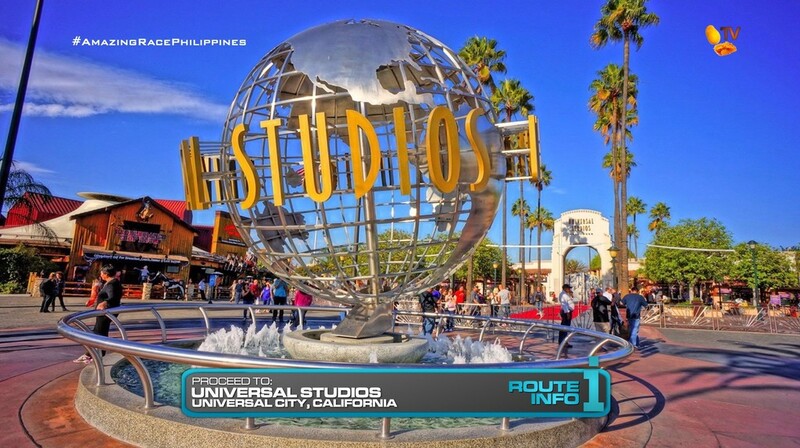 For both Detours, teams must make their way to Universal Studios. 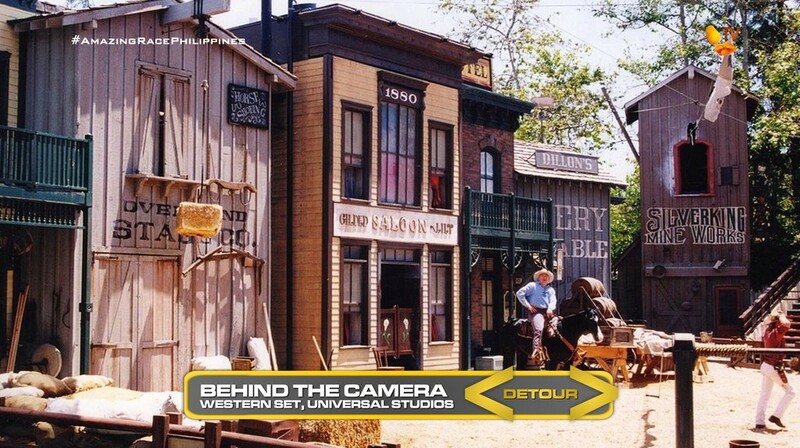 In Behind the Camera, teams will join the production team of a new cowboy western film by preparing a movie set for filming. Adhering to a set designer’s plans, teams must correctly roll out heavy props into position as well as ensure all parts of the scene are in place. Then, teams must prepare the director’s bank of cameras and monitors. Once the director is satisfied with their work, they will receive their next clue. 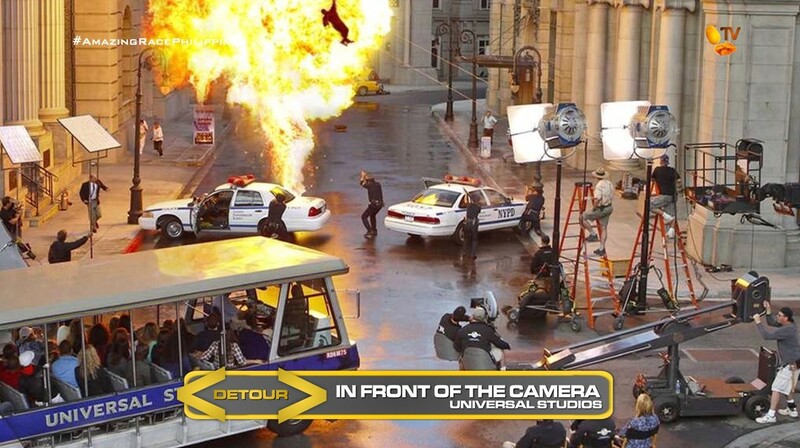 In In Front of the Camera, teams will become the stars of a big action movie. After dressing up, teams must learn their lines for a crucial police standoff scene which includes a shootout and explosions. Once ready, they will act out the scene and hope to impress the director. If their performance is to the director’s satisfaction, they will receive their next clue. 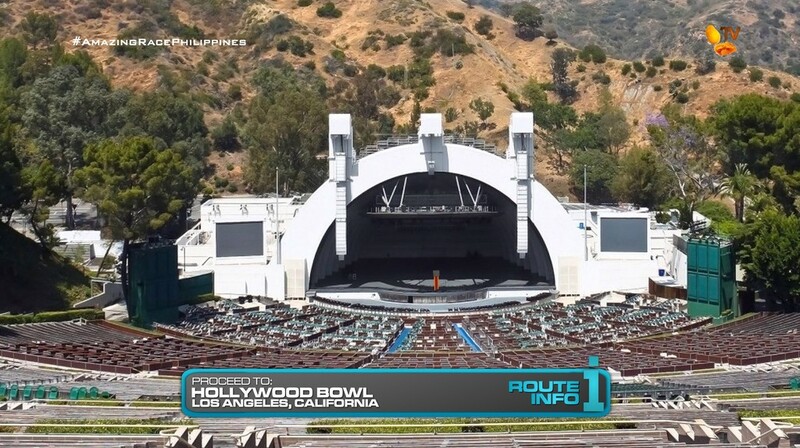 After the Detour, teams will be asked to find the “Home of the Los Angeles Philharmonic Orchestra.” They will need to figure out their next clue awaits at the Hollywood Bowl. 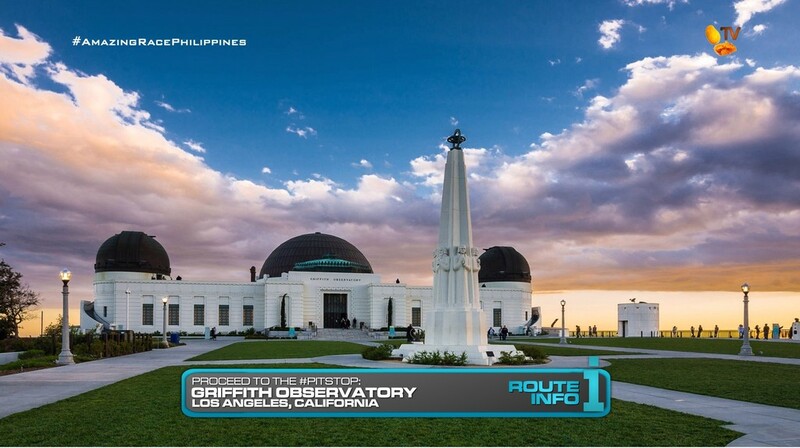 And that clue directs teams to the Pit Stop, the Griffith Observatory. The first team to check-in here will win P200,000 courtesy of Shell V-Power Nitro+. Half of that prize will go to their charity of choice. But overall, this Leg would be best with regular people. Especially regular ol’ Filipino teams who get to have a Hollywood experience. Anyway, having Filipino teams driving in Los Angeles would probably be one of the funniest, most cruel things you could have them do. LA traffic really lives up to its reputation. And teams will be thrown right into the middle of rush hour traffic in the morning. Mojave is a pretty long drive from LAX. And then they’ll have to drive back into the city probably around noontime. And finally to the Pit Stop, it’ll be around evening rush hour. Should provide for some great drama, yeah? I’ve wanted TAR to visit an aircraft boneyard. So why not have TARPH do it here. I didn’t really know what kind of task you could do here though. Searching through planes is the simplest thing, but they could do anything like assembling or disassembling planes. Maybe transporting parts from a plane and loading them onto trucks and stuff or prepare them for shipment to wherever they’re going. As soon as I saw those videos of Los Angeles releasing the shade balls, I knew that I had to have that as a TARPHDME task. It’s a timely task and it can be a physical challenge too, especially right in the middle of the day in the Southern California heat. And of course, being in Los Angeles, you have to have some kind of Hollywood movie task. The Detour is a good place for that. Who knows how much it would cost for TARPH to film at Universal Studios. lol But for now, money is no object! Hehe. The Detour should hopefully be balanced. The acting side of the Detour should definitely be more fun and exciting. But there will need to be something that makes it more difficult and should make teams think doing the set design side of the Detour is smarter. Or at least, have them consider it and/or switch to it later. The Hollywood Bowl is just an extra task to both throw teams into LA traffic as well as add another iconic Hollywood location. 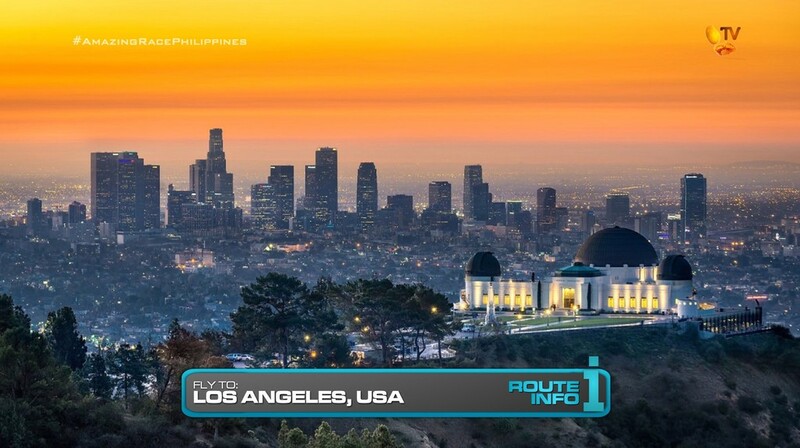 And the Griffith Observatory, a TAR Starting Line, should be a perfect Pit Stop. Especially in the late afternoon and evening. Should be beautiful.